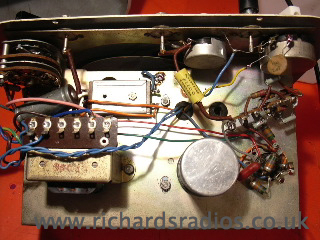 This is a mid 1950's signal generator with some novel features. It was made by Test Gear (Acton) Ltd. and is model no. CG6/1. It covers the RF ranges from 1KHz to 100 MHz in 6 ranges. It has an AF and an RF output. 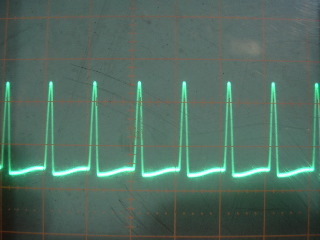 The novel feature is a tuning indicator stage into which the output of the radio being aligned can be fed, obviating the need for an output meter. 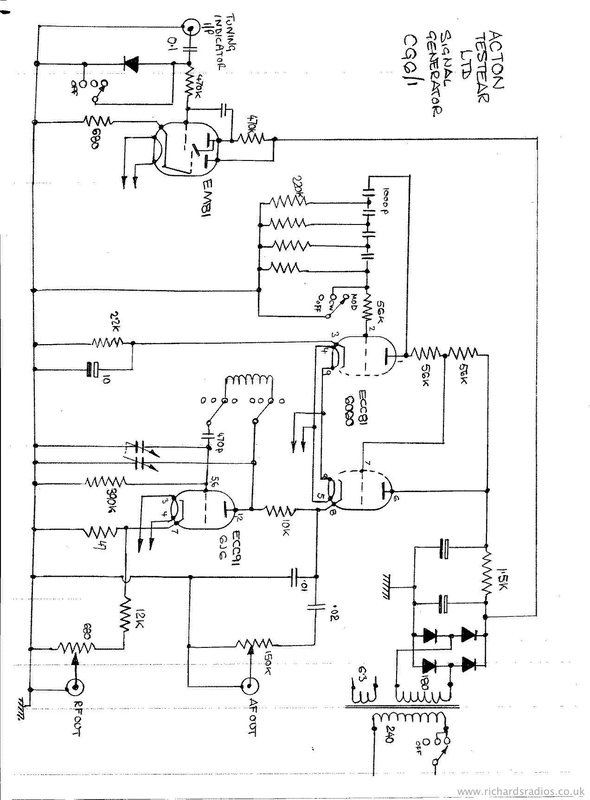 It is a two valve unit with a contact cooled metal rectifier and a tuning eye valve. Complete and original, in a steel case. 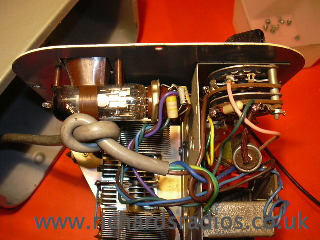 AC power supply built in (the electrolytic smoothing capacitor is dated August 1955). Alan Randle has one of these and he pointed out that the RF output on his was via a .005 disc capacitor rather than a 12k resistor. This seemed to me to be more sensible so I cleared a bit of bench space and opened mine up again and soldered in a capacitor as suggested. Here are some internal pictures and oscillogram of the RF output at 1MHz. As you can see I have replaced the resistor with a .005 disc. The AF capacitor is a replacement I put in some time ago. The diode mounted directly on the switch is, I believe, a replacement as it was poorly soldered. Note that the variable capacitor has two unused sections, I wonder if there was another model which perhaps covered a higher frequency range? 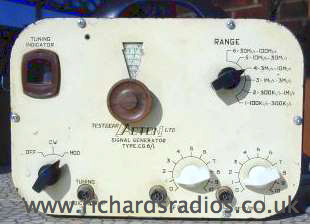 I have now discovered that these were made by Test Gear (Acton) Ltd. readily and were sold by Radio & TV Components (Acton) Ltd. High Street, Acton, London W3. Several models were manufactured from government surplus components which were readily available after WW2. This may explain why the variable capacitor has redundant sections. 1MHz on range 3 CW output. I only get sinusoidal on the highest range and part of the second. Frequency looks about right though.